After a flood wiped out the offices of Hello Games on Christmas Eve, fans' first thoughts turned to No Man's Sky, which wowed viewers of the Spike VGX a month ago. Will that game be delayed? "We won't let that happen!" The studio writes. Despite high-spirited statements, an update today does paint a grim picture. "We lost all our PCs, laptops, equipment, furniture, dev-kits, work in the blink of an eye, and our insurer (and those of those around us) seem like we won't be covered, or at least responsibility is unclear," writes Sean Murray, the studio's managing director. "I don't want to say out loud the value of what we lost, it's horrible. It would probably fund a small game :("
Murray admits that "I've wanted to be depressed, to wallow, but it's impossible surrounded by this team. If we've lost some work, we'll make up the time." He joked that the studio would work on a boat, if necessary. Some fans have asked if Hello, makers of the Joe Danger series, would turn to Kickstarter to get back on their feet. 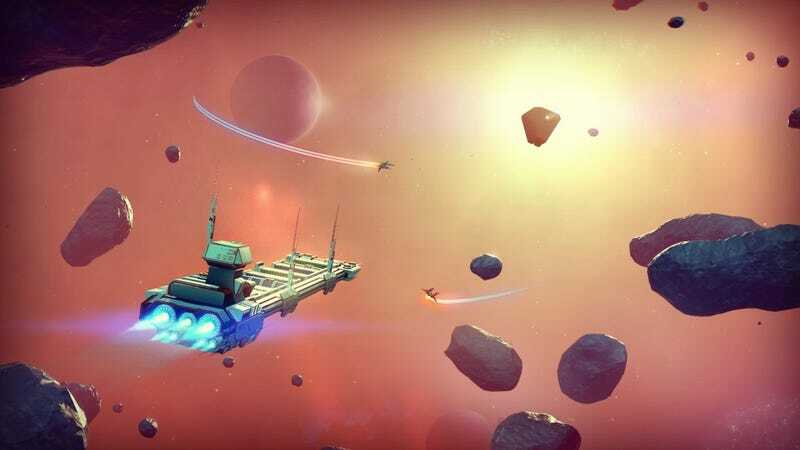 "I just don't think it's the right thing for No Man's Sky right now though," Murray says, "and we'd probably rather not eat than do the wrong thing for this game. For now, the team is working at a cramped temporary location, with others working from home. They expect to move to a new officer or rebuild the old one over the next few months. "Maybe Christmas was a bad time for this to happen, but New Year's couldn't be better for a fresh start," Murray says. "I couldn't be more excited for 2014. Oh and a minute ago I saw something amazing Dave just got working in No Man's Sky (I can't help but see it, because he's practically sat on my lap)."